In BayanLoco, a peri-urban slum of Kafanchan, Nigeria, one organization — Fantsuam Foundation — is working to empower women and other members of this underserved community find jobs and income to meet their needs. As part of its mission, Fantsuam offers ICT skills training to local youth, who often have little — if any — opportunity to learn basic employment skills that can mean the difference between success and a life in poverty. Before deploying Inveneo computers in March of 2008, Fantsuam had traditional computer labs where donated computers ran unprotected software. The combination of unreliable and expensive power, rampant viruses, and inexperienced users often made the lab inoperable. 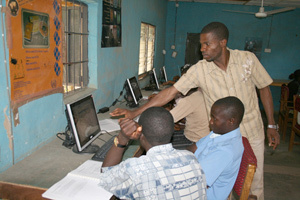 Not only did the downtime reduce Fantsuam’s ability to offer much-needed training services, but the computer lab also became an overall drain on its resources and finances. After switching to Inveneo Computing Stations running Ubuntu Linux, powered by deep-cycle marine batteries that are recharged through solar panels, Fantsuam is achieving a whole new level of impact. Now the computer lab has significantly more up-time thanks to easier-to-maintain computer systems and a more reliable and cost-effective energy solution. And the solar-power solution has reduced Fantsuam’s fuel bill for their diesel generator by 35 percent. 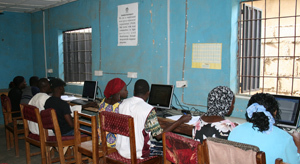 Today Fantsuam is able to offer more ICT skills classes on their schedule, not when power is available. Enrollment has jumped 57 percent to an all-time high. In addition to lowering the costs for each class by requiring less energy (plus using solar power) and requiring dramatically less support, the students now have a better and more stable learning environment, which gives them greater confidence with computers. By lowering the cost of ICT training classes, Fantsuam has taken a financial drain and turned it into a revenue generator. And the new revenue stream allows Fantsuam to expand its training and order ten more Inveneo systems. 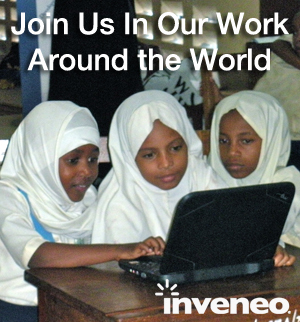 Fantsuam was so impressed with the difference that the organization became decided to go though the certification process to become a local Inveneo Certified ICT Partners in order to is roll out more Inveneo-based ICT training centers in its service area.